Summer Help - Start Looking Now ! - Outside Help - 2009.Jan.29. Summer Help - Start Looking Now ! Can you use some summer help ? Do you have a home office ? Now, is the time to start looking for summer help. Get the jump on it. How could you use help? I could personally use help with my 3 kids. I love my kids and want to spend time with them this summer. However, wouldn't it be glorious if a nice college or high school girl came and got all 3 of them Monday - Friday for 4 hours a day and took them to the park or to one of their summer activities like swim lessons or tennis lessons ? I am the expert at my business and would rather have someone spend part of the day with the kids so I can blow through some work during daylight hours vs. working at night after everyone is in bed like most of us mompreneurs do. Also, it wouldn't it be great to go on a date once a week with my husband on Friday or Saturday night. When is the last time you and your husband went on a date ? I was polling my girlfriends who are also mother entrepreneurs and asked them how many times they went out with just their husbands last year. The average was 3 times - our anniversaries, our birthday, and our husband's birthday. What !!! Not one of them had gone out 12 times - that's once a month ! So, back to this summer help. Can you put a posting up at the local community college or university.... "Looking for Summer Help - 20 hours a week minimum - $15 an hour - caring for 3 great kids, running errands, office help - Call 555.1212 so we can meet and we can test the waters with a few weekend trial runs". Offer these college kids a competitive wage so they won't want to work at the mall. I have a very clear set of expectations for that competitve wage. I expect them to provide lunch, pick up the house with the help of kids, do dinner prep, run errands like dropping something off at the post office (like internet orders :-), and clean up after meals. I explain to them that I need them that when they leave I can't have an hour or two of housework and picking up and cleaning up to do after they leave - that leaves me in a negative place with extra work to do after they have left. I have found it to be very successful when you go over your expectations at the initial meeting and again at the first visit. Don't think - "Oh, the first time they watch the kids I don't want it to be too much." Wrong ! Make sure you have them do other tasks than just the kids the first time so they know exactly what to expect. It's not too soon to get looking and scoop up the good ones first and have them start on Friday and Saturday nights so you can try them out while you and your husband go out for coffee or dinner. Then you have tons of time to find other help if you don't have a zippy and energetic college girl helping out with the kids. Last notes: ask for a resume even if they are 16, ask for references and call them even if they are 16, and the first 2-3 times they watch the kids have that happen when you are actually home so you can observe them from and see how they interact with your kids. Honestly, some of the high school sitters don't make it past watching my kids when I am home - so, they don't graduate to watching them when I am not home. One example of this is a nice high school girl just sat and "observed" my kids and "supervised" the kids and therefore it really wasn't any different than me throwing in a video - no interaction with them even after coaching her... "they really like to play board games, the baby loves when you get out his books and read him stories, they love craft projects". Nothing. She was a dud and the baby (1 yr old) kept coming looking for me every 10 minutes. "The phrase 'Working Mother' is redundant!" 10 Ways to Come Up with New Ideas! Get Inspired! You know, there are times when my brain is simply too tired or overwhelmed to produce many (if any) new ideas. There is many a day when 4pm rolls around and I realize I haven’t thought of what to make for dinner for my family of five. I open the fridge and freezer and stand there, staring, literally hoping for something to jump out at me so I don’t have to think up what to cook. My brain is so tired I can’t even remember the standard meals I cook, much less come up with anything creative, new and exciting to try. And then there are times, like now, that my brain is about to explode due to all the creativity coming out of it. I used to scratch down an idea on a piece of paper when it hit me. Then I started keeping them in my business notebook as they came to me more frequently. Now I’m creating whole spreadsheets of ideas to keep track of them, and they just keep coming. Are you looking for something to write about for your blog, your newsletter, for an article, for a marketing piece, or for a special report, e-book or book? Could you use some help brainstorming ideas for a new product, program or service you could offer? Need a strategy for generating engaging topics for your podcasts, teleseminars, or workshops? I’m happy to share with you a few methods I use for kicking my imagination and creativity into high gear. Hopefully you can find a few that will work for you, and you’ll be well on your way to developing some fresh content for your business this Fall. 1. Focus on the part of your business you love. Just think about the parts that make you happiest. If you love talking, is there a new venue/forum that you haven’t tried yet? How could you teach others something about this thing you love? 2. Pick a partner and do some collaborating. You’re good at what you do; now go find somebody who complements your strengths and can help you develop your offerings in ways you couldn’t come up with on your own. 3. Check out your email inbox. Do you notice any frequently asked questions in there? Create a special report, an e-book, or a podcast that answers those questions and make it available to your customers and prospects. They’ll be grateful you did, and it won’t take you much creativity at all to answer these questions. 4. Create an add-on to something you already provide. Is your e-book/book selling well? Fantastic! Now create a workbook or study book that goes along with it so people can create their own path from the insights/lessons your book taught them. Doing teleseminars? Why not package your audio files with a questionnaire or worksheet and sell that as an information product? 5. How’s your existing product funnel? Take a good look at it and decide if/where there are any gaps. Do you offer products/services for free, low, medium and high-priced? Does one offering logically lead to the next, higher-priced one? Create items that fill in these gaps. 6. Have someone interview you (live or just recorded). Have them ask you who your target market is and what their top challenges are. Answer these questions, and let the creative juices flow. Often times being asked questions and having to answer them in real time helps your brain think in ways that sitting at your desk all by yourself just doesn’t. 7. Ask your team to review your web-site & offerings yearly. Aks your coach, mentor, board of advisors, supporters to review your website and all of your offerings. What would they like to see? Ask them to tell you what’s missing. 8. Keep a notebook handy. As ideas come to you, write them down. You will not remember them later. If you can’t get to your notebook, consider using the voice memo feature on your cellphone/smartphone, or even call your own answering machine and leave yourself a message with your bright idea. Do it IMMEDIATELY before you lose it! Great ideas seldom re-visit tired mompreneur brains. 9. Spend some time exploring. Surf the web, search on keywords that are relevant to you and your business, and see what your competitors or colleauges are doing. Can you emulate something you see? Is there a way you can make it your own, with your personality, brand and flavor? 10. Get out of your office. Go for a walk, a hike, a bikeride, anything outdoors and in Nature. If you’ve been stuck for a while without new ideas, a change of pace and setting might be just what you need. Spend time with friends and family and turn off the “business brain” for a while. A little R&R goes a long way towards giving your mind the flexibility to generate new, different, exciting things that will benefit you, your business, and your clients. "A bend in the road is not the end of the road...."
"A bend in the road is not the end of the road... unless you failt o make the turn." Get Local on Yahoo and Google Today ! Every business that has a physical storefront location needs to get on local.yahoo.com and maps.google.com. Often when someone is searching online the Local Yahoo Listings come up first and the Google Map Listings come up first. We all know that the better & higher placement online is the better. The higher on the Top Ten the better. Also, customers give more credibility to the local listings, especially since they can see other customer's reviews of those businesses. Your web-site is only as valuable as how many people see it. The more people see it translates into more sales for you. People think of advertising on the web in big huge terms. Think of more narrow and specific terms. If you are a local knitting store in Royal Oak Michigan then you want to target customers within 50 miles of your store. Are you going to focus on paying for ads or targeting your business for anyone in the United States looking for yarn or want to know about knitting? No, she wants to focus on getting people that live in the area to her store. When they type in "knitting stores royal michigan" she wants to come up Number #1. By the way, local knitting store in Royal Oak, Ewenique Knits ( http://www.eweniqueknits.com/ ), owned by Amy Goller and Marilyn Grazioli comes up #1 on the Yahoo Local Listing, which appears before the general listings and she comes up #1 on the general listings. Way to go Amy ! Keep up the good work and keep listing your business on local sites. Check out their fantastic store, resources & classes, and of course their Knitting Rocks shirts. p.s. sometimes your business is already listed because it was pulled from another source, it is your responsibility to update this information ! Twitter for Business - What is a Twitter Profile Review ? Are you tired of constantly hunting for your next customer? Are you spending a lot of time, money and energy advertising, marketing and attending networking meetings, but not getting enough sales? Wouldn’t it be nice if your customers found you instead? Even better, how would you like it if people you don’t even know were busy promoting and recommending you and your business to others while you're off spending time with your family? Twitter is the answer to finding more customers. However, there are many people on Twitter and it is just not working for them and they don't get it. They are stuck at 100-1000 followers and can't seem to move forward. I can teach you what Twitter is and how to really make it work for you and your business. You can't just show up and hope it will happen - you need to know how to do it right and do it well. I want you to work smarter, not harder! All types of businesses - product based, direct selling, or serviced based - would benefit from engaging in using this fantastic and necessary social media tool called Twitter. Whether you own a brick and mortar business, offer professional services, run a non-profit agency, manage a business group (like a chamber of commerce), have a retail store, or sell your products online - Twitter can work for you to Grow Your Business. What is a Twitter Profile Review? A Twitter Profile Review is a personal and in depth look at your Twitter Profile. How are you tweeting? How are those tweets presenting to your Twitter Community? Are you only tweeting personal tweets? Are you only tweeting business tweets? How do you integrate both personal and business seamlessly. What is your profile picture and bio telling the world about you? What is the most effective way to use those 160 characters you are given in your profile bio area? What tools can you use to make tweeting for business easier? How do you tweet about your business service or product in an appropriate, authentic, and non-spammer way? How are you building your Twitter community with your Target Market? What percentage of your tweets should be Sharing Resources like links to web-sites, blogs, and articles? What percentage of your tweets should be Engaging and Connecting with our people? What percentage of your tweets should be just Chirping about your life? When are the busiest times daytime hours on twitter? When are the busiest evening hours on twitter? How can you tweet during these times & not actually be on twitter live? How many e-mails are in your inbox ? How to keep it to 50 or less ! I have 2 personal e-mail accounts and 3 business e-mail accounts by necessity. How can you keep what's in your inbox to under 50 e-mails when you might get 100 e-mails in one box in one day ? So, many people I know are afraid to turn on their spam filter to the highest level which is delete anything that looks like spam. Everyone is all afraid that they are going to lose that all important e-mail. Then what happens? You keep saying you review the "possible spam" and you never do and you have 687 e-mails in the "possible spam" folder. Look, it just doesn't happen.... people do not have time to review their spam folders. Just set it up to delete them... that one e-mail a year or even a month that gets deleted will be resent to you or that person may just pick up the phone to call you ! Do not move any of your unresolved issues to a folder even if it is a "to do" folder. Again, you think you will look in that folder and you won't. If you leave any unresolved issues in your inbox, you will see it staring at you everytime you log in.... this way it will not be forgotten in a folder. Go through your unread messages fast. Is it a file it now, act on it later, act on it now ? Only deal with what you have to deal with now. Set aside time every couple days to clear out the act on it laters. If items are grouped by sender, it is easier to sort through them and file them in a folder or group delete them. I receive many offers a day from book sellers, coffee companies, my vendors with specials. I keep only the current offer and delete the rest. Sometimes, if it is an extended offer or coupon I will file it in a folder marked with the company name like "Barnes and Noble" and then when I am heading to the bookstore, I can pull up the latest coupon fast. This doesn't seem like a serious goal, but it is. Given the amount of e-mails we receive a day, this will give you a little time to play catch up every couple days if you get busy and can't manage your e-mail for a day or two. Are You Ready to Crush It ? Rich German did an interview with best-selling business author Gary Vaynerchuk. Rich German is committed to showing you how to Energize your Business and your Life. One way Rich does this is with his monthly interviews with leaders in their industries. On Wednesday, March 10th at 8pm (est) Rich did an exciting live interview with Gary - this is not to be missed if you are interested in Growing your Business! Gary is not only a master of personal branding and social media but more importantly he has mastered the art of living with passion! Want to start a business based on your hobby or passion? The first thing you have to know when you are evaluating whether or not to turn your passion into a business is your level of commitment. Having a hobby is a lot like being single—you can work on your hobby (i.e. go out on a date) when you feel like it, or stay home in your pajamas and watch TV if you don’t. Hobbies don’t demand anything of you (just like that casual date you had last night). You can work on your hobby every free minute you have, or put it down for a year, or change your mind and forget about it completely, with few repercussions. But just like with a marriage, if you pick the right work, the work you love, turning it into a business can be deeply fulfilling, not to mention fun and profitable. It boils down to one question. Are you ready, willing, and able to commit? But do you wonder if you have what it takes to turn your passion into profit? Paperwork Paperwork Everywhere - Are you buried in it ? I hear over and over again from Mom Entrepreneurs that they are buried in paperwork - no matter how small or big of a business paperwork is a huge stress for business owners. The first advice I have is to get yourself 4 boxes - they can be rubbermaids or cardboard boxes. I find old photocopy paper boxes are awesome - they are a great size, and have lids, and stack beautifully. You can get some from an office or I buy them from Staples for $1.49 each or wait for a 10-pack of file boxes go on sale. Next get 7 clear 12x12 envelopes. You can get these at the dollar store or Michael's individually or in a 10-pack in the scrapbooking section (remember your Michael's coupons!). Label these boxes and put them on the floor in your office or designated sorting area. Now you are ready to take the first step. Gather all the papers you have from your ENTIRE house in ONE location. I have worked with many friends and clients and there are papers hidden everywhere! I mean everywhere! You get those papers from the kitchen, from your bedroom, from your bathroom, from those kitchen drawers, then den, the drawer in the china cabinet, that box in the basement, that box in the garage, that rubbermaid under the bed, that plastic bag stuffed in a closet. I know and you know you have papers hidden everywhere! You get them all and put them in one room. I mean it! Don't just get your office papers or just your home bills. Get ALL of your papers from everywhere. This first step is to tackling all of your paperwork. Paperwork can stress you out and overwhelm you. This is something you need attack and stay on top of and have a system of how to handle each paper that comes into your house instead of letting it pile up all over. You need to be in charge of these papers not let them take charge of you and interfere with your effectiveness in running your household and your business. TIP: Do this with a girlfriend and some music or a chick flick. Trade with another mom business owner - she helps you with her papers one weekend and you help her with yours another weekend. So, now you have your piles of papers, magazines, bills, receipts, take out menus, school notes, everything all in one place. Start sorting! I want you to do a relatively fast sort in this process like the pre-sort on Clean Sweep before you get to Peter Walsh (the Peter Walsh detailed sorting and letting go comes later in the process). You will be amazed at how much is in your Garbage / Recycling box! You may have to empty this one more than once to your recycling bin. You will see how little value some of these papers, old magazines, old mail, and old fliers have after you have had them hanging around for weeks or months. So, getting these sorted in their boxes fast will at least help with retrieval of documents until you have come up with a system or process for each box (forthcoming blogposts:-). So, if you are looking for a school paper you can at least just look in the school box. I used to have people just do the box sort and the last several clients I have worked with we have added these 12x12 special clear envelopes because we inevitably run into all kinds of HOT super important papers they have been looking for and lost. Examples may include: HOT work papers that need to be acted on in the next 7-10 days, important HOT home papers like bills that need to be paid, important HOT school papers like permission slips and forms. Take-out menu Envelope - everyone has these scattered everywhere and can't find them when they need them. Take all your take-out menus and keep just one most recent copy of each in this folder along with any coupons you have for eating out. You will run into these all over the place while organizing and now you have just created an easy and portable home for them ! Finally, there are some people that getting organized will always be a great struggle and has no joy for them. I highly recommend enlisting the the help of a professional organizer to come in and go through your entire home office with you. 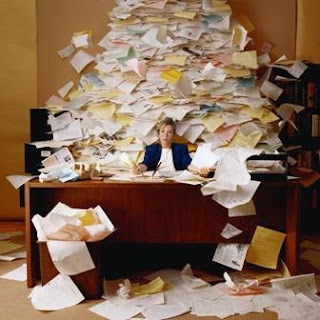 A professional organizer can do wonders with your mountains of paperwork! She can get through a huge backload with you all the while setting up a system and process for the future for you to maintain. If you need help finding a professional organizer, I would start with checking the National Association of Professional Organizers. If you need additional help finding an organizer, tweet me on twitter at @TimeOutMom and I will help you find one in your area.